Jerusalem (Agenzia Fides) - "As Franciscans, we see these eight centuries as a manifestation of God’s Providence, fidelity and goodness towards us, because he chose a simple, poor, colorful ecclesial instrument that is at times a bit messy, to carry on, not our history, but His own, which is always a history of salvation", said the Custos of the Holy Land, Fr. Francesco Patton, announcing that the Friars Franciscans of the Holy Land celebrate 800 years of their presence in the Middle East, with three days of conferences and meetings in the Old Town of Jerusalem. Minister General of the Order of Friars Minor, Fr. Michael Perry, will open the anniversary celebrations with a liturgical ceremony on 16 October at St. Saviour church. The following day, the Prefect of the Congregation for Eastern Churches, Cardinal Leonardo Sandri, will speak about "The role of the Franciscans in the Holy Land", whereas October 18th will be dedicated to the reflection on the significance of the frescoes in the Upper Basilica of St. Francis in Assisi. A copy of the frescoes has been on display since the month of May at the entrance of the Custodial Curia of the Holy Land. 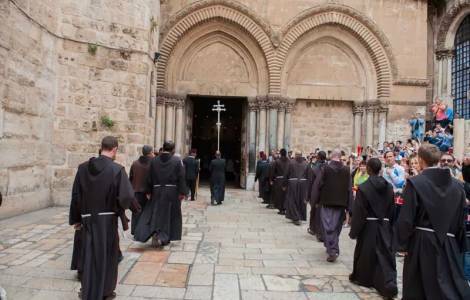 The celebrations for the 800th anniversary of Franciscan presence began in June when the friars went on a special commemorative pilgrimage to Acre, the site of the Franciscans’ first landing in 1217. The goal of the Custody of the Holy Land is to carry out a series of initiatives over the next two years so as to commemorate also the encounter that the founding father of the Order, St. Francis, had in 1219 with Sultan Malek-El-Kamel, in Damietta, in Egypt. The first Franciscan friars landed in Acre in 1217, led by Friar Elia da Cortona.